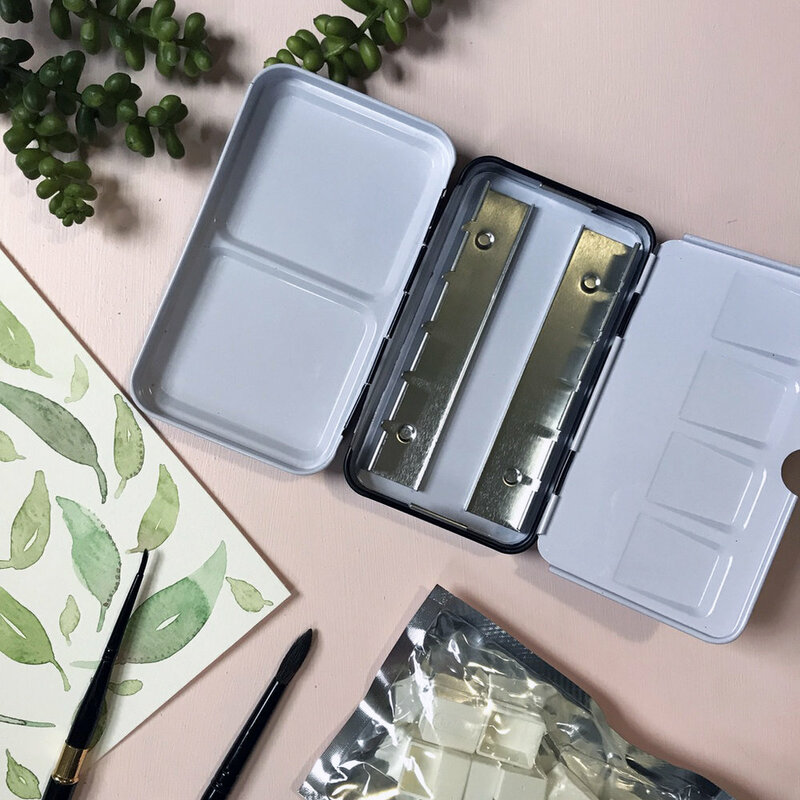 Creating quality artwork or other goods usually leads to wanting to share them with the world, especially if you're doing it as part of a business! Social media sites like Instagram give artists & sellers an opportunity to showcase their work to a large audience and hopefully lead them back to your website or shop, but if the photos are poorly lit and the products don't stand out, viewers are likely to scroll on by. 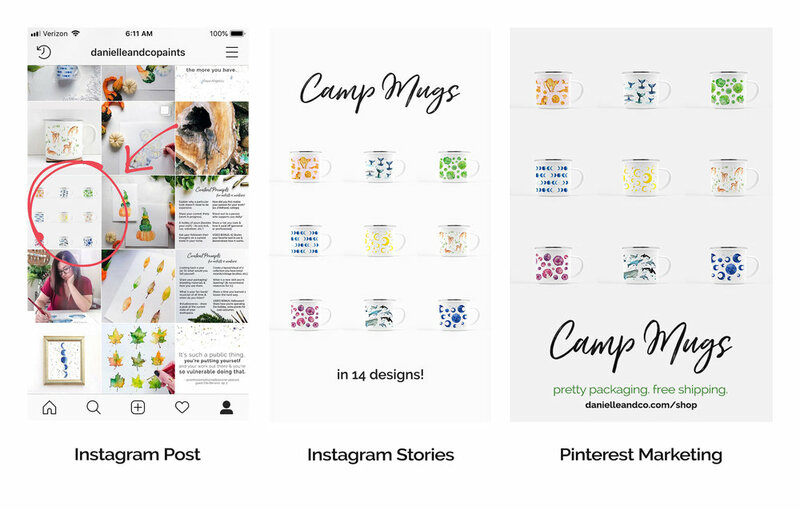 Listings on shops like Etsy and Ebay are much more likely to sell if there are multiple, clear and well-lit photos that display the product in an attractive way. Displaying your work well helps you stand out from the crowd, and builds a sense of credibility for potential buyers and clients. If you're just starting out, you don't need to spend a lot of money or have a large studio space to create attractive photo backgrounds! Today I'm going to share how I created three backdrop options (marble-look, blush pink, and pine wood) for about $27! 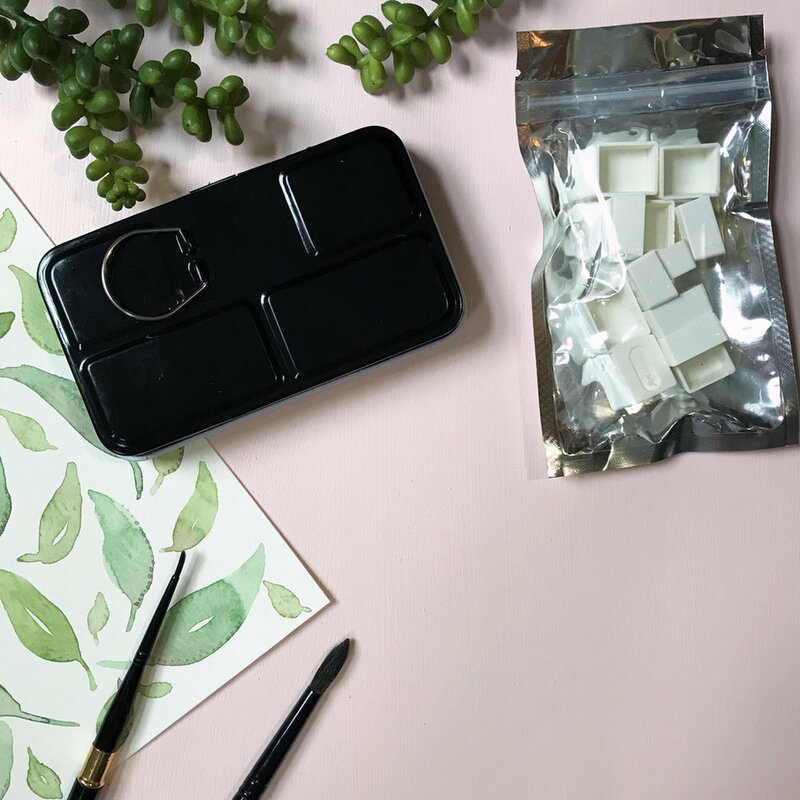 Keep reading for information on what supplies I used, how I DIYed them, and examples of how I'm using them to photograph artwork, giveaway prizes, and more. One of the first decisions you need to make is what style of backdrop will best showcase your work. Having consistent colors, textures, and overall design look will help brand your work and create an overall polished and professional atmosphere. I chose to create a white marble-look backdrop, a blush pink backdrop, and a light-wood tone backdrop for my own work. I believe my work stands out better against light backdrops as opposed to dark ones, and I know I prefer the look of Instagram accounts that are bright and clean-looking. Both white marble and blush pink are very popular backgrounds right now, so while they may not be unique or original, I know that viewers respond well to them and I enjoy how they look overall. The below instructions could be easily updated to suite your personal tastes! You could choose any paint color you prefer, stain the wood backdrop any tone, or chose completely different contact papers; the possibilities are endless! All of my supplies came from Lowes (this is not a sponsored post; it's just my favorite local hardware store option). One quick trip and about $27 later, I had everything I needed. Birch plywood square plank, available in multiple sizes (Mine were $7.44 each, and are about 2'x2'. 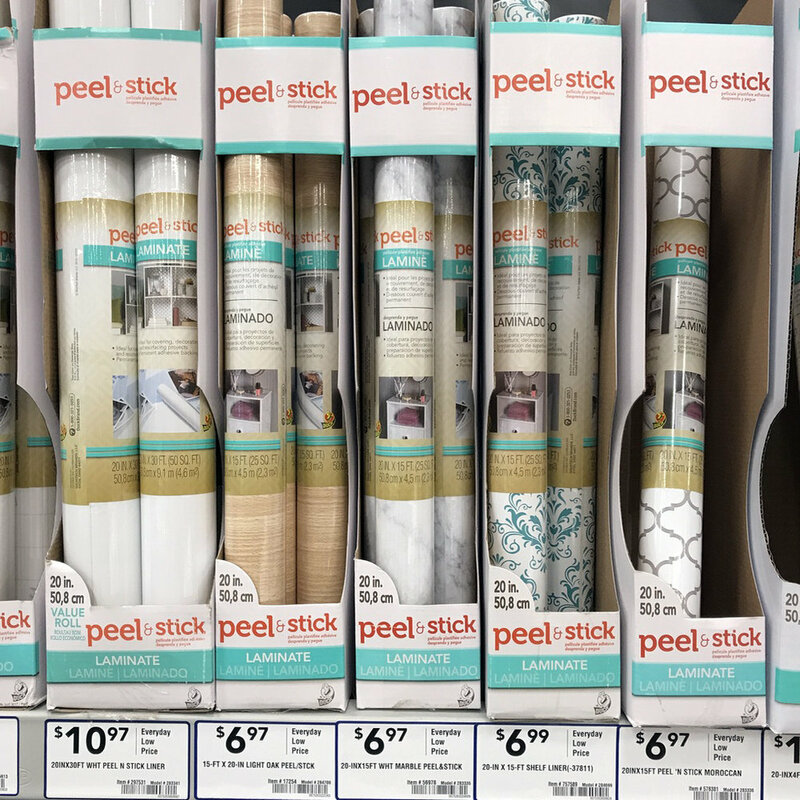 Peel & Stick Shelf-Liner, $6.97 for a 20" x 15' roll from Duck Brand (I chose White Marble, but you can see below how many options there are! I only needed a small portion of the roll. Let's start with the marble backdrop! This is so simple, it almost doesn't need instruction. It's as simple as lining your shelves or sticking up wall decals! I began by laying my birch plywood board down on a flat surface, and choosing which side I would stick the shelf liner to. My boards had one side of the wood in better shape than the other, so I chose the worse-looking side to stick the shelf-liner to (since it would be covered up). I grabbed a sharp pair of scissors, and rolled out my shelf liner (or contact paper - whatever you call it). This brand of shelf liner comes with a convenient grid on the back, which was nice for making a straight cut. It is only 20" wide, which is shorter than the 24" width of my board, so I knew I would have to use the entire width of the paper once, and then cut a strip slightly wider than 4" to cover the difference (and ensure I didn't have a gap). I decided to put down the narrow strip first, and then the wider piece second to ensure it was laid down straight. Following the typical instructions for putting down any sort of adhesive liner, I began by sticking down the short edge and then slowly adhered the length of the liner to the board, pulling off the backing paper as I laid it down and smoothing down the liner carefully to eliminate bubbles. A credit card can also help with smoothing it down. Below, the 4" strip of liner is down, but the larger piece hasn't been put on yet. If you put it on a little crooked to begin with, no worries; it is adjustable for awhile, as long as you don't try to unstick it too many times. Once I had it down straight and the bubbles all smoothed out of it, I made sure the edges were smoothed down too so it wouldn't get snagged. While there is a visible seam in the marble pattern, I haven't had it be a big deal when actually using the backdrop; I'll explain more toward the end of the post, and you can see some examples of it in use with no visible seam! Above, you can see how smooth it turned out, even on the rough plywood surface! This particular liner has a realistic-enough marble look, and also isn't too shiny on camera, so it got a thumbs up from me! Also, I only used a small portion of the roll, so have a lot left over for future projects... or even just lining my shelves, if I ever get around to it. Let's talk about the painted background now! This could actually be started first, and then the shelf liner backdrop made while the first coat of paint dries. I grabbed a cheap foam brush for less than $1, to save time and avoid washing paint brushes, etc. This was meant to be quick and easy, and I knew I didn't need a fancy brush for this particular project. The brush was a little too wide to fit in the paint jar, so I just tipped it sideways to drip the paint out on the surface as needed (a more narrow brush or pouring the paint into a wider container would fix the issue, too). I simply applied a smooth, thin coat then left it to dry for about an hour while I went and worked on other things. Tip: wrapping your foam brush in saran wrap while the paint dries will keep it fresh, and if you stick it in your fridge you can even wait a day or two before coming back to the project. After it dried, it was definitely splotchy, as you can see in the photo below, taken right before I began the 2nd coat. 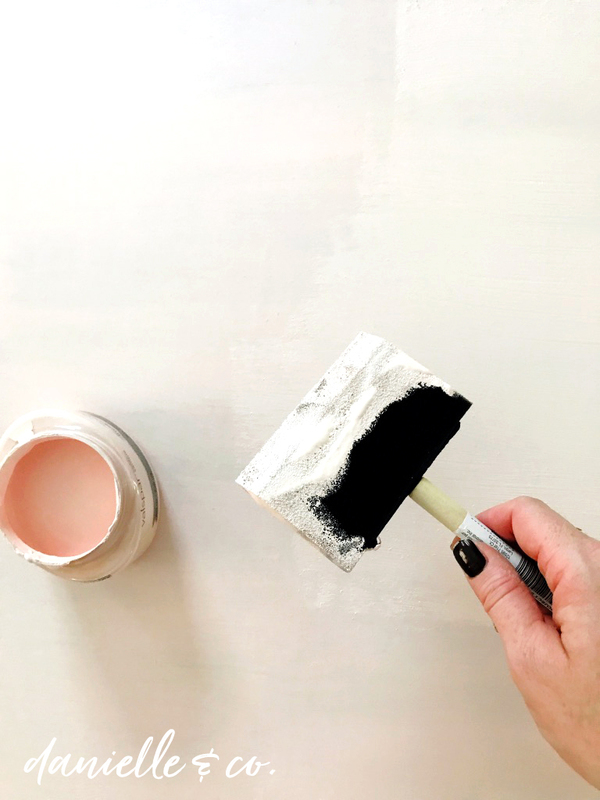 This paint by Valspar is a high-quality one (it's also what I use to paint my walls at home, too) so I knew a 2nd coat would likely do the trick. After applying another smooth, even layer it looked great! Below, I carried them outside so I could get a good picture of the marble and pink backdrops together. The love how the pink tone turned out; it was exactly what I was going for! While you can see the seam in the marble shelf liner, in most photos I place the artwork on the side with the wider piece of liner, and I've only needed to use Photoshop once to blend the seam out. The plain pine backdrop is just the unfinished side of the blush pink backdrop. I made sure to save the best looking side of wood planks for this; I also plan to use a matte finish varnish spray to protect it, but am waiting for good enough weather again to do it outdoors. Living in upstate New York is no joke when you're trying to do DIY projects. 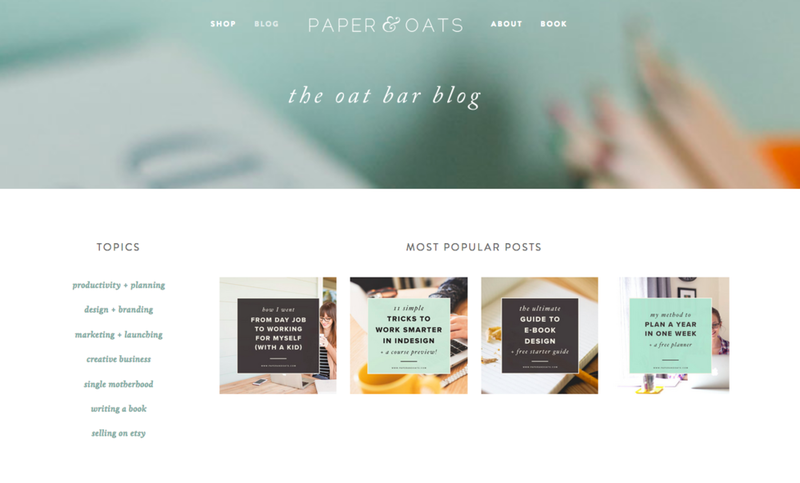 Below, you can see examples of how I have used all three backdrops to showcase my artwork and even create blog post and weekly giveaway images! Using a limited number of backdrops has helped me create a consistent style, and I don't need to stress about where I'm going to shoot photographs. I love how the pale pink backdrop turned out, but I make sure to change it up occasionally with the wood and marble styles, too. While I mostly use the backdrops for photographs, below is an example of when I used it for a video backdrop as well, when I shared a process video of painting this little goldfinch. I keep the backdrops stacked in a corner near where I work, and pull them out as needed. (You can also read about my video set-up and supplies). Well, that's it! I hope this has helped you find some ways of creating attractive product photographs of your work without having to break the bank with expensive supplies. I'd love to see some examples of what you make, and if you get creative with colors and textures - please tag me on Instagram or shoot me an email with the results of your own DIY backdrop adventures!